Did you finally tally up what that set cost you with not even counting your labor or sweat equity ? I would love to do a side by side blind test with an original. If anyone would like to donate a pair, I certainly will not object to thoroughly testing. Very well said. I'd nominate this thread to become an announcement or sticky. There is lots of good information, answers to common questions, and good feedback from @willwilly. The speakers do look amazing, "a most excellent job." I do hope you veneer the M7's, possibly in something exotic. The 7's hold a special place in many polk and non polk fans. But its not my money, so I know how that goes. If you wrap them, I'd still vote for something stunning, but not too crazy. I'd hate to take you down the rabbit hole, but if you can find a decent set of separates, or mostly a good separate amp, I think you will be amazed at the bass difference it makes. Sometimes the bass doesn't seem much louder per se, but it has much more impact and all the music is more detailed. As I mentioned previously, you start hearing things you may never have noticed before. It becomes even easier to isolate different sounds. Most of all, I'm glad things are turning out well, and you're seeing the fruits of your labor and the advice. Thank you for the thread. Please KEEP me on Ignore, as you said you had done in a previous post. Unless your motive is to simply bicker with select posters for unknown reasons. I changed my mind as I could not let you run around here dishing out misinformation any longer. Deal with it or not, I don't care. With your EQs turned up all the way in every frequency that can happen haha! I am VERY impressed with your project and how it turned out. I'm sure you will be a very good fit around these parts. Sunday Morning listening on M10's. Wow. One small question, while you were building these fabulous cabinets did you also seal them internally? You mentioned air leaks somewhere in a past post. PS they look fantastic, great work. Enjoy the fruits of your labor. Polk 3.1TL (Gimpods boards, Sonicaps, Mills Res., Dynamat, Sonic Barrier, Hurricane Nuts, Cabinet sealing, Glue of magnets,Cardas Binding Post upgrades) - to be relegated to my daughters system eventually as I permit or am ready to part with. Nothing other than all the joints are glued with biscuits. The only air leak I had was the tweeter before recessing. When playing around with a rescued pair of 5's, I have to admit the lobing issue from side by side drivers is evident to me now. The tens sound much better but the "imaging", using this word lightly since I'm just starting to recognize what it is, is muttled compared to the fives. I look forward to my sevens. EDIT: Like I said before, the M10's are good speakers, just not great. I'd gladly own another pair if the right deal came along. If you just want an awesome tonal signature and don't care about the stereophonic qualities, they are a top contender for anyone. I have had a wonderful time with this project. It has inspired more ideas and other possibilities. 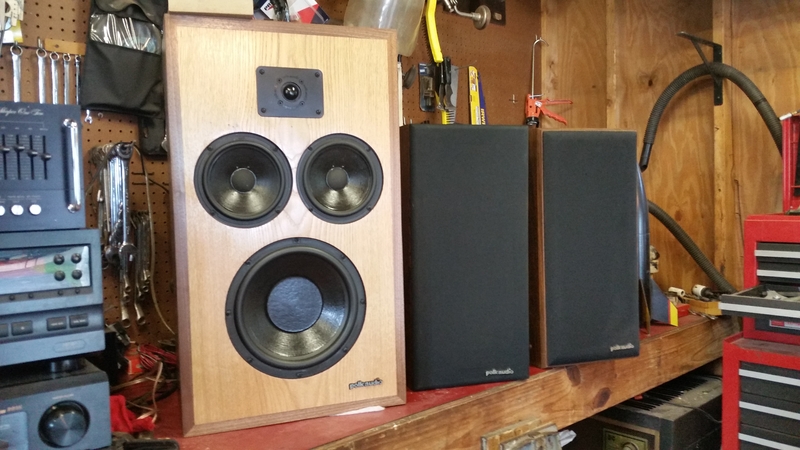 My initial idea was to build a nice pair of speakers I fell in love with many years ago. A familiar story. After all that, I am very comfortable knowing I recognized a good pair of speakers in the day. I compared everything to them, never owning a pair. What I have learned, Monitor 10's are great speakers, the speakers you roll out for the 4th of July patio party, Barn dances or Church socials. Great for the shop, Jazz, Piano, Classical, Pop, ROCK, They will project! I have mine with a vintage Polk sub, A simple integrated 100w receiver in a high ceiling shop, Perfect for rock'n while you're drin... working. But I've been ruined forever. Ruined like the day a friend made concentrate on the laugh track most sitcoms use, letting you know when to laugh. Imagining is lost in 10's, it's there but nothing like single driver Monitors. They would be fine in the living room but for real sit down, good listening speakers, I can do better but stay Vintage. Thanks for bumping this thread. I had not seen it previously, and so I binged on it this morning. Thoroughly enjoyed all of it. Your speakers are fantastic! Learning from the experience of others is perhaps the most difficult thing to accept and accomplish. You succeeded 100%. 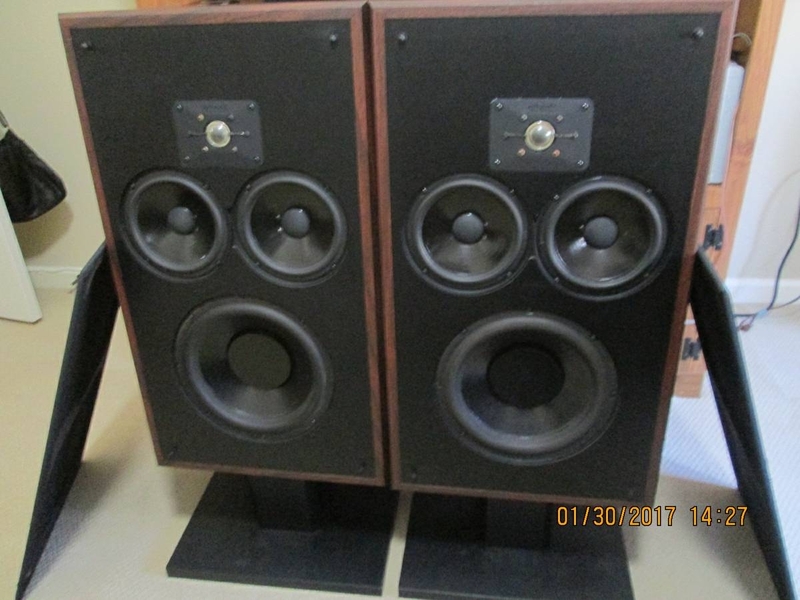 I saw these Monitor 10B's on Craigslist Atlanta this morning. They have original boxes and the stands. I don't remember your talking about stands for your "masterpieces". I hope to rival your build with my rta15tl. It will be a long while before they or completed or revealed but they will most definitely be one of a kind. This was an excellent build! The custom woodwork is 1st class. If and when I get a set of 10's I will try an inductor on one of the MWs just like I did for the TMM project. It got rid of the lobing. Kudos. Still going strong. I never added the screens, just don't want to cover up the wood! So I'm thinking about selling these clone M10's to fund my next project. Anyone interested. Not sure of a price. I know I have more than $800 in parts, wood... Not including labor which is a contribution for most of my projects. This was one of my favorite builds to read about, and I am still amazed at the wood work. I have no idea on a price. 10's get less love. Others would know more. I would be really intrigued see what these would be like converted to SDA's. A crossover from a CRS / 2B? would be needed and I think new drivers as well. Someone else may know more about the cabinet size and how the PR would react. I don't recall if the 10 and CRS share that as well. That may bring new life to these for you, and more interest if you decide to sell them. It's been done. A 2A or 86' CRS+ Crossover will work with the existing drivers. 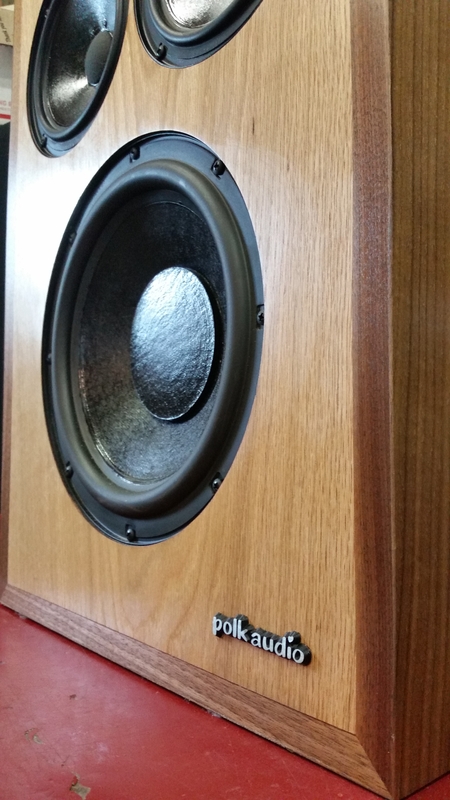 The 2B/87-89' CRS+ crossovers will work also, but you'll need two MW6511 dimensional woofers. 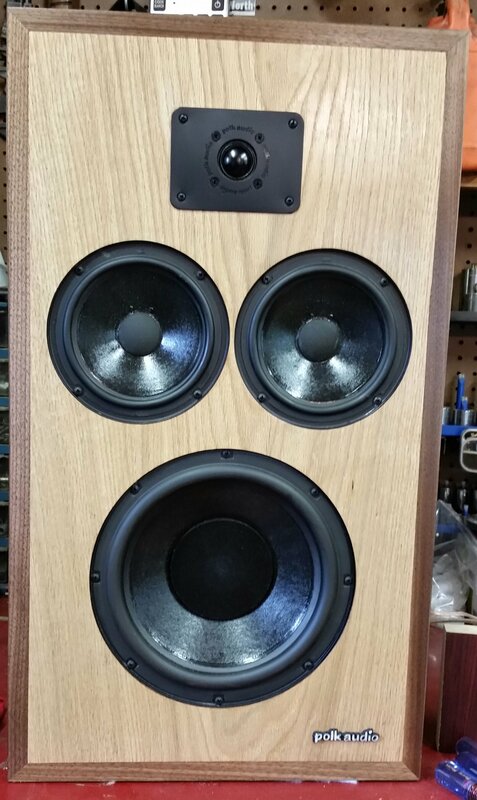 I'm not sure you will get any more than around $300 for them, and that might require a true Polk enthusiast. 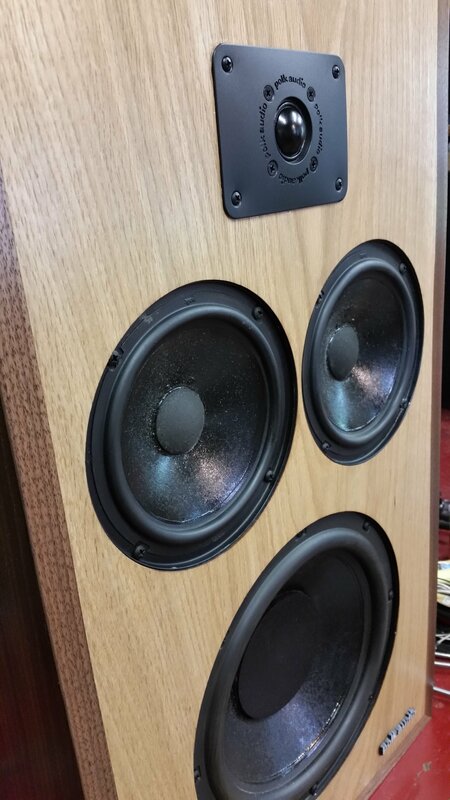 The cabinets are fantastic and the work is top notch, but the speaker itself is limited by used prices around $100. I actually think PK might have a good option for you given the excellent cabinet work. We had a member experiment with that option and he found it to be more enjoyable than the M10. Personally, I think these just become heirloom pieces. They are easy to pass to family because their tone is so enjoyable and they are now works of art. Since you'll never get close to your investment, keeping them in the family might keep the payoff higher for you.